Do you ever feel like you just keep going round and round that mountain? Like you keep taking one step forward and 3 steps back from where you believe you need to be? Do you have desires and emotions that seem to come out of nowhere and take over your actions, leading you to do things you don’t want to do? I have. I spent years in the grip of what I call a comatose depression, confident that God could deliver everyone else around me EXCEPT me, because my case was hopeless. I would be blindsided by panic attacks at the thought of social situations, or sometimes simply when I was alone. 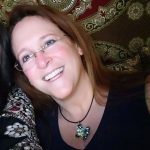 I have an astounding 4 decades of eating disorders “under my belt” – binging, starving and purging. I let my lifelong belief that I was unlovable because I was supposedly fat and ugly lead me into broken and destructive relationships, including extra-marital affairs, and stop me from even trying to be a success. I tried being people’s savior, trying to fix their brokenness by “loving them more” – a codependent people pleaser who tried to manipulate people into needing me and therefore never leaving me. And I was actually in some form of ministry during all of these seasons and challenges in my life! I covered it up as well as I could, and pushed harder to distract people from my character defects by being smarter, more talented, more efficient, more perfect, more loving, more intelligent, more accomplished, more successful, more Christian than everyone else. But the truth was that I carried deep shame and soul crushing guilt due to what I considered as my continual failure to measure up, and that horrible nagging feeling that I was continually disappointing God because of my lack of self-control in so many areas of my life. But that’s not who I am any more. Like Paul, I have found the secret of how to be content in all situations, whether I have much or little, or weigh much or little, or accomplish much or little. And it didn’t happen because of my Bachelor’s degree in Religion, or by being a licensed minister for 20 years. It’s not due to being a pastor or bible teacher or author or counselor either. It’s because I made the decision to move out of my comfortable misery and into the risky, unknown and uncomfortable process of being vulnerable with God, with myself and with others and pursuing my healing at any cost. And it worked. I don’t have to compete or achieve in order to feel ok and accept myself. I don’t have to look a certain way to be loved or accepted. I don’t eat out of anxiety, fear, depression or even boredom. I experience a freedom unlike anything I’ve ever known in my past 5 decades. That’s because I learned the secret to uncovering my root issues and undoing their widespread damage to my life. Most importantly, I now experience true and abiding peace, long term contentment regardless of my current situation, and freedom from the compulsions that kept derailing every one of my efforts to live a holy and righteous life surrendered to God’s Holy Spirit. I am now free to pursue the fulfillment of my Kingdom purpose and walk in my calling with self-control, unhindered by these issues. Why did it take me so long to get here? Because no one could tell me what was wrong with me in a way that made sense to me, and no one could tell me exactly how to change it. Everything was vague – pray more, read your bible more, talk to a counselor, have more faith, surrender more thoroughly. Well, that might work IF my emotions, desires and habits didn’t continually undermine my every attempt to live a godly life for more than a short season at a time. I could get it together for a period, but something would always happen to cause me to lose self-control and return to my knee-jerk, lifelong ways of handling life. I’d lose weight, sometimes a lot of it, only to find myself returning to eating foods that were unhealthy, addicting and dragged me further away from my goals of self-restraint. I’d tell myself I would have higher standards for men, and then give in to the first womanizing manipulator that came along. I’d tell myself that no one was perfect, and then punish myself for every last mistake I made. I’d tell myself that God loved me and died for me just as I am and that I am enough, and then forget about it by morning. 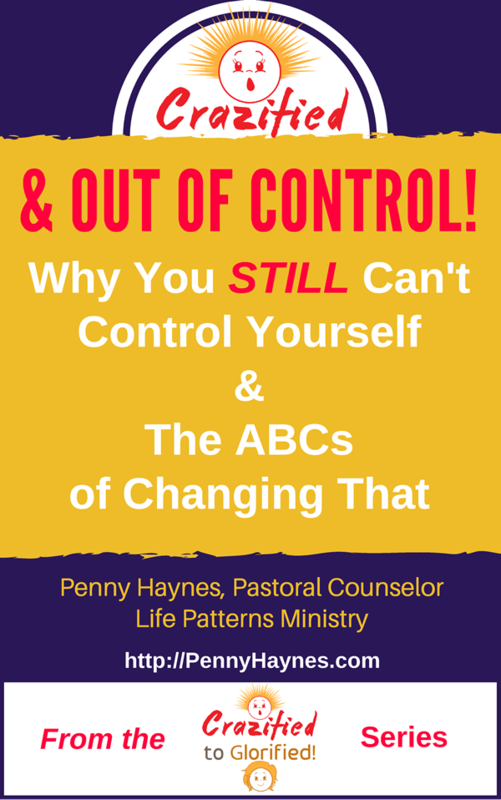 But through years of Recovery and becoming a Life Patterns Coach, I came to understand my Life Patterns, what they were, how they were created, and how they could be dismantled. Only then was my life radically changed. I learned how to distinguish between the alternate realities I had created for myself and the truth of what had actually occurred. I determined not to skim over the most painful memories of my past in the hopes that they would eventually just fade away, but instead, with a supportive group, dove back into them and courageously faced what I had been desperately attempting to mentally escape all these years. I continue to pursue every issue I recognize, dealing with them one by one. Now, my relationships are not unhealthy – I’m no longer drawn romantically to broken men, or to codependent friendships with broken women. I can be honest with the people closest to me without fearing rejection and abandonment, and am even able to express my anger in an acceptable and righteous manner when I and my boundaries are not treated with respect. Angry people in authority no longer send me into a panic attack, and I am finally not afraid that making a mistake will literally end all life as I know it. Depression doesn’t have to keep you in bed all day, exhausted at the thought of having to deal with anything or anyone in the world. You don’t have to explode with anger when your buttons are pushed, ruining your relationships with the people you love the most. You don’t have to live a life cycle of procrastination followed by crisis management, making everyone around you miserable as you drag them into your panic induced fiasco. And you don’t have to fear that you will always, always be alone and unloved because there is just something innately, irreparably wrong with you that can never be fixed. There’s nothing wrong with you that can’t be fixed. I’ve walked women through the process of self-evaluation and seen them walk away in only one session free from a history of nightmares. I have worked with women through inexplicable panic attacks and guided them through their own thoughts and emotions, resulting in them uncovering their own conflicting beliefs that had kept them in a self-destructive cycle for a lifetime. I have helped women confront the awful truths of physical, emotional and sexual abuse at the hands of people who were supposed to protect them, not try to destroy them, and have seen them rise from the ashes to live a life filled with security and free from fear. I’ve walked women through the aftermath of discovering their spouse had cheated on them, and all of the emotional shrapnel that it brought up in them, and see them completely change directions and have their marriage not restored, but rebuilt on the foundation of God’s principles. 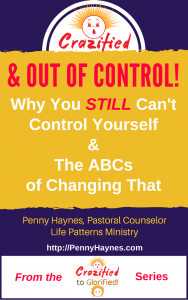 I’m Penny Haynes, and I help Christian women break free from depression, anxiety, addiction and unhealthy behavior so they can finally enjoy life and fulfill God’s purpose for them. I am like a sharp shooter who picks off what’s stressing you out. I will lead you step by step away from your “Crazified” life to one filled with peace, joy and righteousness. If you are ready, then let’s RESET your Life Patterns starting now.